First round playoffs (vs. Caps) begin Wed - go here. After two victories against Philly, now it's time to play playoff hockey. 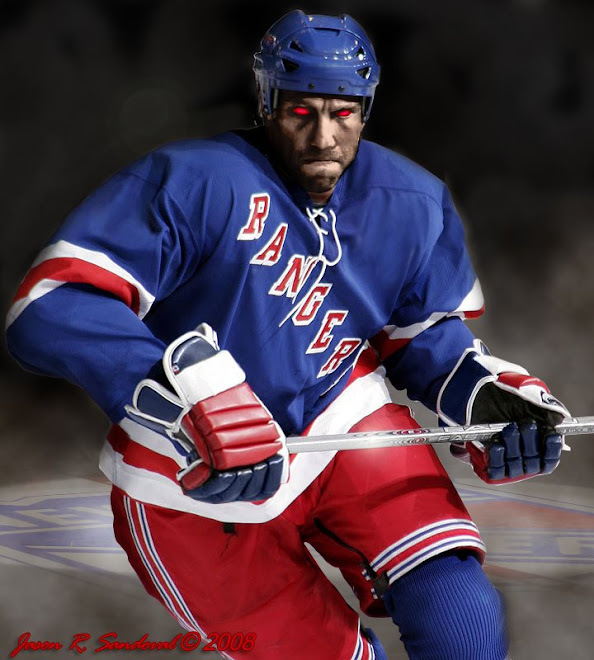 Let the games begin and LET'S GO RANGERS!!!! Dark, Who would of thought? Winning 3 in a row, sticking a fork in the Flyers hopes of home ice, and heading into Washington in a positive frame of mind. I keep saying to myself..."but we have Lundqvist" over and over. Interesting, indeed. 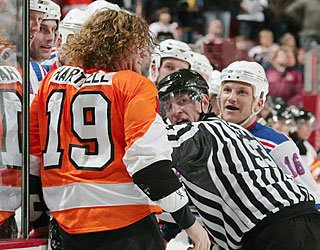 I'll say it for you..
We have Lundqvist.. We have Lundqvist..
Scotty Hartnell is a f'ing goon. You see after Avery gets railed from behind, Hartnell came skating in to hit him again? Then he gets up in a fit after Avery pounds him. The interesting part about the Avery situation at the end of the game was Gomez coming in to protect him. The team may be gelling at the right time. The Eastern Conference first-round match-ups are simply great. Two Fantastic long-standing rivalries and two interesting match-ups (NY/Was and NJ/Car) with significant playoff histories -- the winners the last time each met in the playoffs won the Stanley Cup.